2011 is turning out to be the year of the SP and the SSP. We were one of the first to spot the Alex Rodriguez mirror image SSP’s and have kept you up to date on all the other 2011 Topps Heritage short prints and variations. 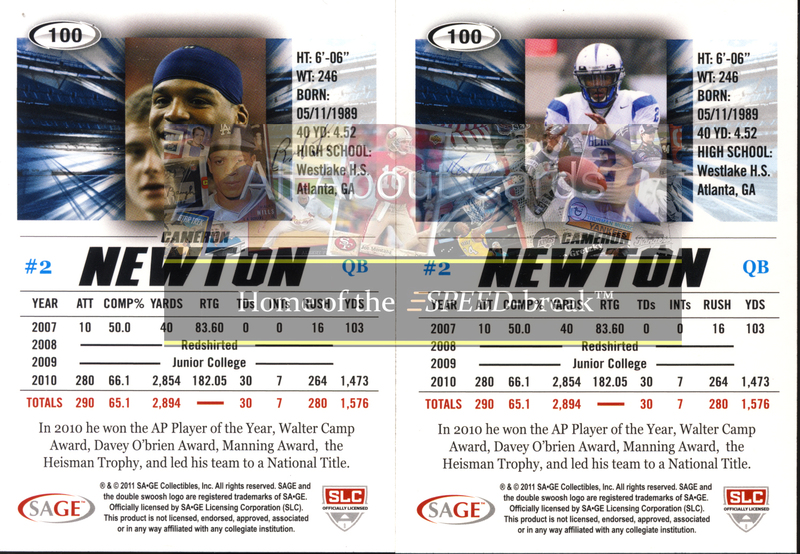 We just did a Box Break of 2011 SAGE HIT High Series Football and noticed something odd, almost another mirror card. Take a look. It’s not a mirror, but definitely a variation of card number 100 as you can see from the back. 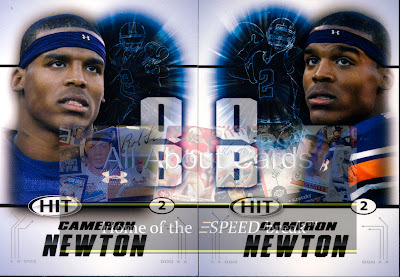 The Cameron Newton with the orange stripe on his sleeve, the one with him on the right side of the card is a short print. But why is does the SP of Cam Newton exist? When SAGE was going to print, they were missing one image, one for a pre-rookie card. That left a blank space on the printing form. To make their deadline, instead of leaving the space blank, they filled it with a 2nd base card version of the Cam Newton. Kinda of a win-win situation, nothing gets wasted and collectors wind up being able to chase a short print of a player who is scheduled to be an early pick in the draft, if not the first pick. The image was used on the opposite side (right side) of the card to allow the SP to be easily identified. So the base card SP should have about the same printing numbers as the Pre-Rookie cards. But what about the Pre-Rookie card that wasn’t printed? The missing image was of Ryan Mallett, another player who is scheduled to be an early pick in the draft. That image was eventually found but it was too late to put in the regular print. The Pre-Rookie Ryan Mallett card (#PR6) was printed digitally, which takes far less time than conventional printing. But it was printed at an even lesser number than the other Pre-Rookie cards, making it a very short print. Here is a look at the card. 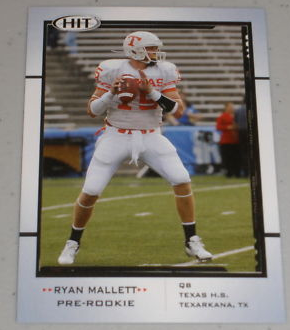 The Mallett SSP was inserted in the boxes of 2011 SAGE HIT High Series Football randomly at the last minute. So be on the look out for both of these cards.